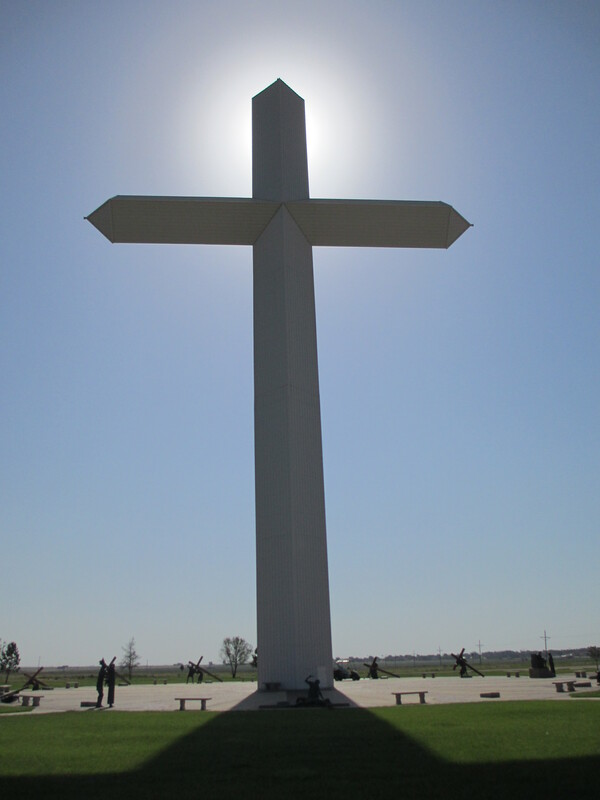 People told me there was a large cross in Groom, Texas. They were right. While the cross can easily be seen from the highway, I opted to pull into the church parking lot to get a better view. 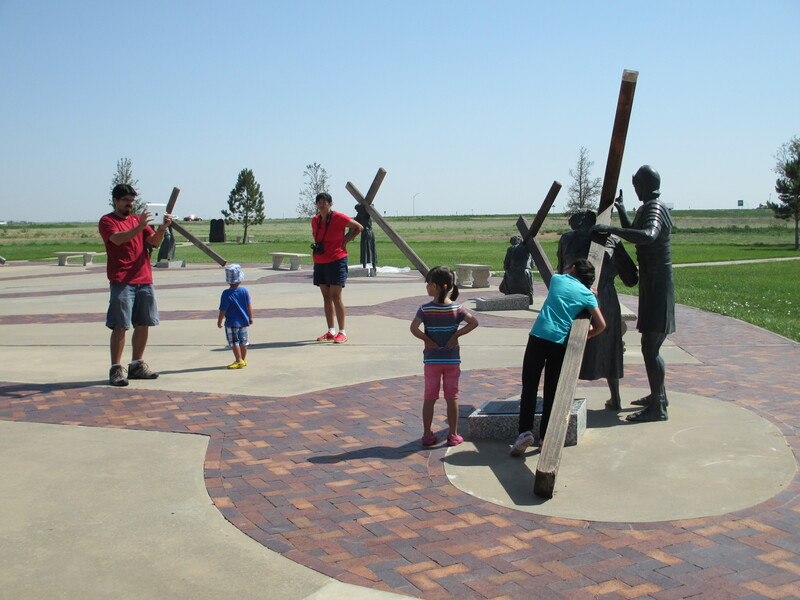 I’m glad I did, because surrounding the cross is the only life-sized Stations of the Cross I’ve ever seen. For those who may not know, the Stations of the Cross are a series of events outlining the crucifixion. They include such favorites as “Pilate sentences Jesus” and “Jesus falls a second time.” You’ll find these stations in many churches, usually as paintings or wooden carvings that line the walls on either side of the pews. We didn’t have them at my church growing up, but my understanding is that you stand in front of each station and say a prayer or reflect on sacrifice or something. But like I said, the Stations of the Cross are usually small and on the sides of the church, maybe tucked under an impressive stained glass window. But in Groom, they are huge. Jesus and the other figures are portrayed in their full size, and it’s a little unsettling to be around. When I first arrived I was alone, and I had time to look at each station. 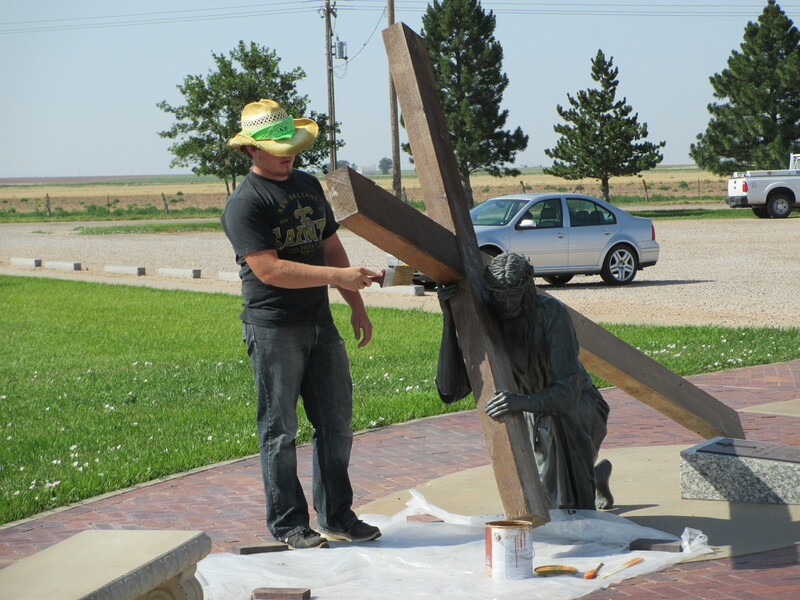 A man was touching up the stain on the cross of the second station. I followed the stations as they made a circle around the huge cross in the center. 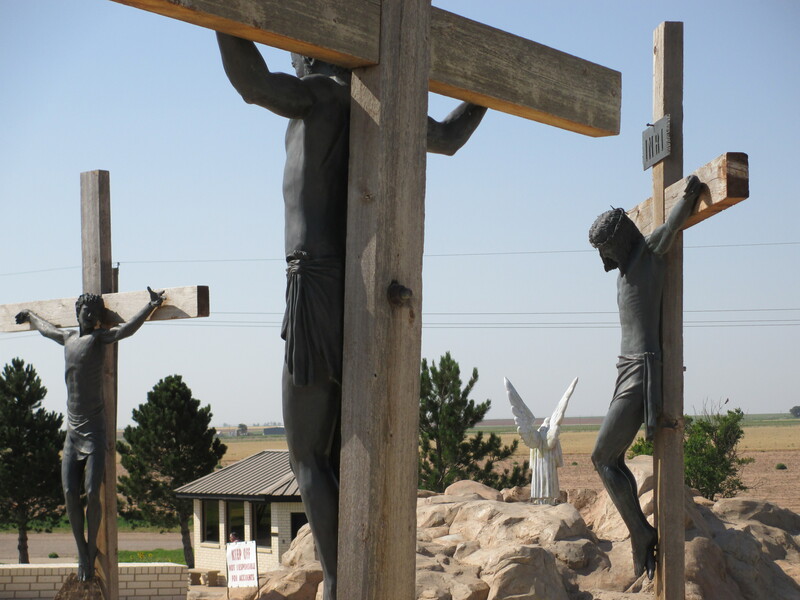 One of the later stations is the crucifixion itself, and for that there was an actual hill off to the side where the figure of Jesus and two other men hung on their crosses. There was a tomb on the side as well, representing the resurrection. However I couldn’t help but notice the resemblance to a tomb in the recent season of Arrested Development, and it brought a smile to my face. There were a few other pieces decorating the area. The church itself surrounds an open courtyard with an impressive fountain. There are the ten commandments, and several plaques outlining important virtues. 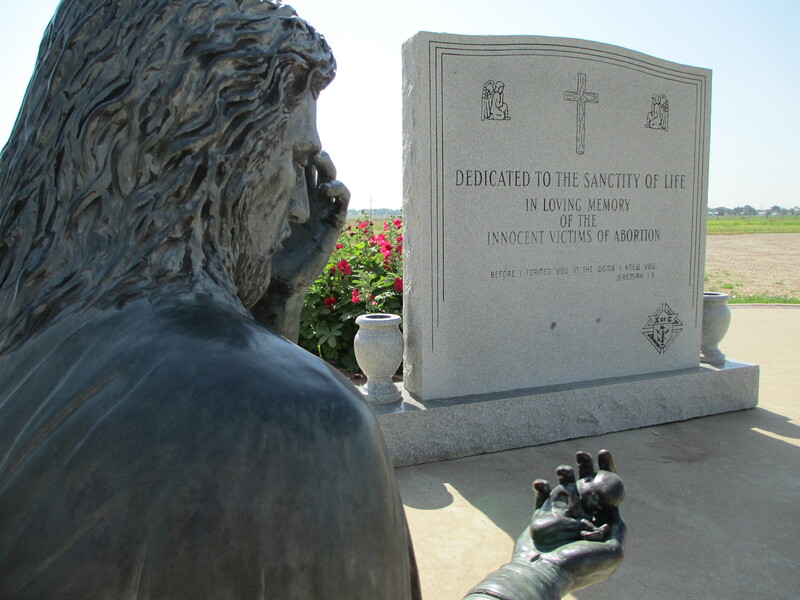 There’s also a truly unsettling monument to the “Victims of Abortion” which depicts Jesus weeping over a fetus held in the palm of his hand. Or rather, he is holding a fully developed baby crafted to be the proportional size of a fetus. I was about to leave when several children and what appeared to be their grandmothers pulled up. I couldn’t help but follow them around, hoping to hear how the kids would react. First of all, let’s face it, when you’re nine any kind of life-sized statue is fun to play on. It doesn’t matter that it’s a man weeping for the women of Jerusalem as he’s dragged off towards a painful death. 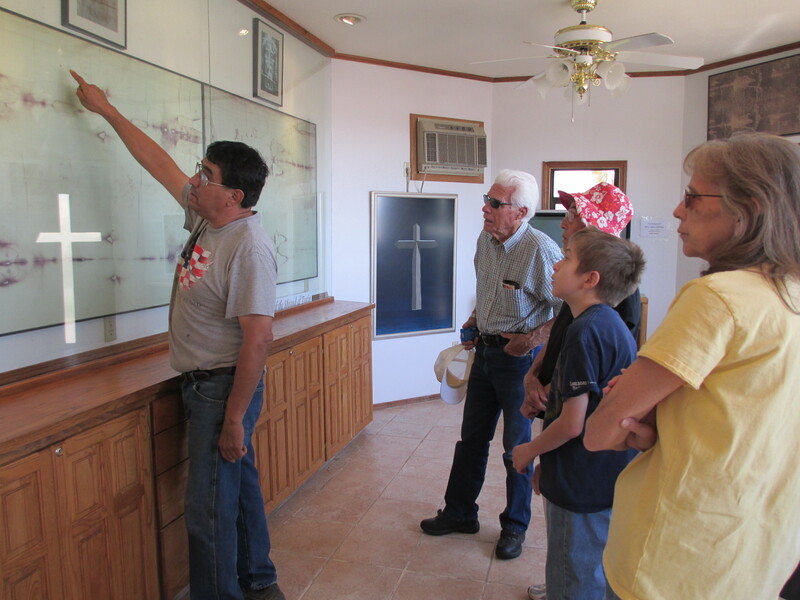 As they went through, the older kids would read the descriptions and the grandmothers would offer additional info when needed. There wasn’t any real religious teaching going on. It was more of an attraction. Another group showed up with more adults than children. A man came out of a nearby building to greet them, and he offered a quick tour of their church’s exact replica of the Shroud of Turin (the supposed burial shroud of Jesus that contains an image of his face and body). I joined them for the tour, and quietly listened as the man explained how they got the replica, all the testing that had been done, and the ways in which the Shroud remains a mystery. While I’m all for a good mystery artifact, you’d have to come up with a lot of evidence to convince me that the image of a face on the Shroud of Turin is Jesus of Nazareth. Why? Because it looks just like him, that’s why. It looks exactly like every painting and poster and image of Jesus found all over the world today. He looks like a European Christian of the twelfth century, not a middle-eastern Jew of the first century. However this was an opinion I chose not to share while in Groom, Texas. The young boy continued to look at the spider, until his younger brother repeated their grandmother’s words, “It’s not bothering you so don’t bother it!” He tugged at the older boy’s arm and they ran up the steps to play near the crucifixion. I can’t help but wonder what causes a congregation to look at their current funds, read over their mission statement, and come to the conclusion: “Let’s build a 19 story fiberglass cross. That will bring us all closer to the Kingdom of God.” What I found more interesting was the fact that the 1992 Steve Martin film Leap of Faith was filmed in and around Groom a few years before the construction of the cross. Considering Leap of Faith is one of my favorite movies and an excellent study on goodness and the power of belief, I’d say Groom, Texas did enough for the Christian faith already. They didn’t need the cross. This entry was posted in Attractions and tagged Groom, Leap of Faith, Shroud of Turin, Stations of the Cross. Bookmark the permalink.